It was yet another long weekend. My plan for the weekend was swinging widely between a 500km ride to Munnar to playing couch potato. Inertia was taking over, as I prepared myself for a quiet weekend at home. I was watching with awe the kindergarten kids perform at Bishop Cottons Annual school day (my nephew, Rishabh received a prize for academic excellence n all). It was only at 4 in the evening, it seemed possible to join them, I left at 4:30. There was also a new silencer and carburetor to put to the highway test. Yercaud is about 250kms and for most part on the 6-lane NH7, perfect for the testing. It took me an hour of restrained navigation in the traffic before I could open up. On an empty stretch of Hosur Road, I opened throttle, there was a definite missed beat. For a moment I thought I was imagining things. Robert Pirsig talks about one having to be at peace with himself if he expects the same from the bike. I attributed what I thought was a missed beat, to my conflict of my perceived self and actual self; one ordering me to turn back and conjuring these cheap tricks (while the other made this theory up!). The theory fell apart as quickly as it came up. The next open stretch and this time, I was looking for it, it was there, a series of missed responses. There was a problem with the new carburetor, the floats that moderate the supply of fuel into the engine was not working in the mid-range. It would work well on full throttle. (I promise I will spruce up the technical section of this blog). It meant I had a situation like in the movie Speed – you can ride only if you are over 100kmph. Just what the doc prescribed, I chucked all plans to abort. At every stop, I spilt some 50ml of petrol from the overflow outlet, I wanted to keep those to a min. Hosur at 6, Krishnagiri as the twilight faded, another 130 odd kilometers via not so good roads to Dindugal and Salem. Rides in the night are a mental drain for the amount of concentration to keep yourself on road, alive, multiplied manyfold, in this case, by the ‘speed’ constraint. I reached Salem at 9, tired slightly, not particularly happy with my decision to ride in the night. There is sheer Magic in the cool, crisp, pristine breeze that welcomes you at the ghats. And in the night, it offered an unparalleled spectacle of sparkling diamonds which transforms into Salem city under the sun. The climb of 28kms took me an unforgettable 60mins, rejuvenating me, simply sooper it was. My sis, bil, and nephews – Rishabh and Aryan were booked at Sterling Resorts, perched right on the hill overlooking Salem. However, this competitive advantage of the location, makes up a bit for the lethargic service. Any hill station worth its salt must have a lake, a few viewpoints, a waterfall and, of course, all those honeymooning couples. After pedaling the full family across the lake, we left the top by 1pm. At the bottom, I bid goodbye to sis, they had plans of visiting Tirupur about 140kms from Salem before heading back. I decided to carry on, my carb still generously donating petrol to the tarmac. Struck a conversation with an old man on a Luna Super, “All the way to Bangalore! don’t feel tired? etc, etc”. I was well on target to be back home by 5-6. On the outskirts of Salem, I realized I probably forgot the novel “A Suitable Boy” back at the resort. One quick dive into the tank bag confirmed it. Is it true for everyone or is it only me, I do have these strong premonitions or do I simply call it a ‘premonition’ only if in fact it turns into one! That is how weird you think when you have to navigate 20 hairpin bends up and down in 2 hours. 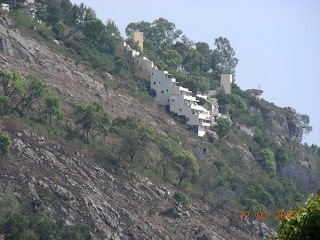 But fortunately, the Yercaud ghats are very precise, one right hand bend, a few smaller ones and invariably a left hand turn follows. Left-right-left-right right-left-right-left and I get back to the Salem Airport deviation, exact 2hrs after, A Suitable Boy stowed up safely. But honestly, it was more than pleasurable to take those curves, twice over! Salem, Dindugal, Krishnagiri and Hosur came and went in one hour intervals and I was back home by 730.Pleasant ride, a treat to the eyes and lungs and a leaky BS29, that was the ride for me. Yyo -- nice blog. Put up more pictures .. The roads are far better now (2009) then it was in 2007. The road from Hosur to Thoppur ghat is well laid and tolled. It would cost 73 rupees. Beyond Toppur and Salem work is in progress and hopefully should be done within next 6 to 9 months. It would take about one hour to get to hosur from Bangalore and then the drive is beautiful. It would take about 2 and 1/2 hours from Hosur to Salem. Salem to Yercaud is a cool 40 Kms drive. It should take about an hour. Anandha Bhavan has become a default stop for car travellers to Chennai or Salem to fill there vehicle and themself. Toll is collected near Krishnagiri (Rs. 25) and Thoppur Ghat (Rs. 48).